On Friday, October 20, 2017, East End Prep was recognized as a double reward school by the state, scoring in the top 5% for both achievement and growth on the 2016-2017 TN Ready Assessment. East End Prep was one of 25 schools in the state, one of 4 schools in MNPS, and the only open enrollment MNPS school to achieve this double honor. On behalf of our scholars, families, and entire East End Prep team, we are excited to share our joy with you! East End Prep ranked #10 out 130 MNPS schools in overall Math & Science performance in 3rd – 5th grade. 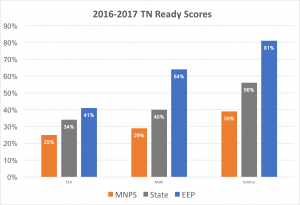 East End Prep ranked #23 out of 130 MNPS schools in overall ELA performance in 3rd – 5th grade. Sign up to receive the latest news and announcements.